The UK-based human rights group Amnesty International has accused China of suppressing lawyers who become involved in politically sensitive cases. It says many have been threatened with suspension or criminal charges. If these measures fail, the lawyers can face detention - or even just disappear, it says. Amnesty says the treatment of lawyers has worsened in recent months, after calls in China for Middle East-style protests. The BBC's Martin Patience in Beijing says Chinese authorities have yet to respond to the allegations in the report, entitled "Against the Law - Crackdown on China's Human Rights Lawyers Deepens". 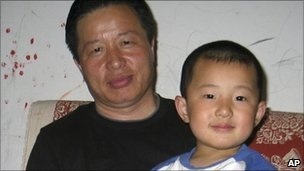 It highlights the case of one prominent human rights lawyer, Gao Zhisheng, who has been missing for more than a year. "Human rights lawyers are subject to escalating silencing tactics - from suspension or revoking of licences to harassment, enforced disappearance or even torture," said Catherine Baber, Amnesty International's Asia Pacific Deputy Director. She said the government's fears of a "Jasmine Revolution" inspired by the Arab Spring have led to the detention of scores of government critics and activists since February. Amnesty alleges that the Chinese government is rounding up lawyers associated with issues such as freedom of religion, freedom of expression and land rights. "The Chinese state is attempting to wield and manipulate the law to crush those it perceives as a threat," Ms Baber said. "Human rights lawyers are being targeted as they try to use the law to protect citizens against the excesses of the state." Amnesty has called for the release of all those detained for exercising or protecting fundamental rights. China has said in the past that it is committed to the rule of law. In recent days it has released two high-profile figures from detention. Hu Jia was freed from jail on Sunday but is being held under conditions akin to house arrest, his wife has reported. Artist Ai Weiwei has been freed from detention but faces a gagging order and huge fines for tax evasion.